Mike attended the pre-view night of the forthcoming Turner exhibition at our local ‘The Higgins Bedford’ museum and gallery. For the first time, nine of the Higgins’ collection of watercolours by JMW Turner are on display, along with a selection of other watercolours by artists who influenced him, were his contemporaries and who followed in his footsteps. The showpiece of the collection being the ‘Great Falls of Reichenbach’ painted in 1804 as an example of how watercolours could compete with oils for impact and scale. A large piece, it skilfully captures the light and perspective of the scene of final showdown of Sherlock Homes and Moriarty. The nine Turners, span his entire professional life, from an early piece done when he was 16 to periods in his later, experimental life. Seeing these pieces close up in very sympathetic lighting and viewing conditions was a complete thrill. Mike saw the ‘Late Turner’ exhibition at The Tate this year, and while not of the same scope there was nothing to take away from the Higgins’ Turners and seeing the well curated ancillary painting from the Higgins collection, which complimented the display of Turners, certainly added to the overall enjoyment. For a local museum, these Turners are really World Class, and with the other paintings on display from the likes of Edward Dayes, Thomas Hearne, John Sell Cotman, and Thomas Girtin, this is an exhibition not to be missed. Given that you can also pop into the Bawden Room and see his Book Illustrations (until January 2016) there’s a lot to see at The Higgins at the moment. 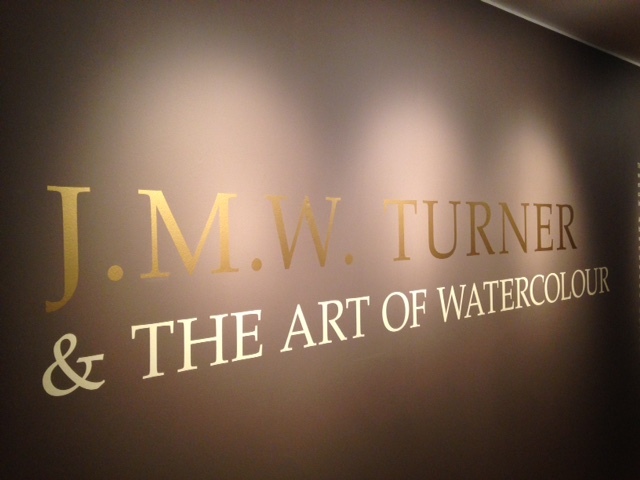 The exhibition ‘J.M.W Turner & The Art of Watercolour’ starts on Saturday 10th October until 10th April 2016.